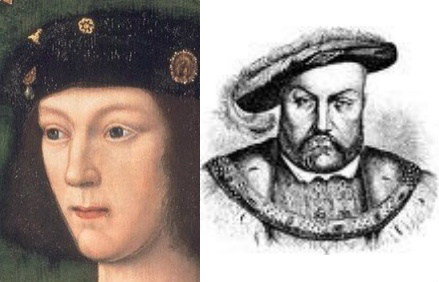 Over the last 2 or so years, I have met some incredible, intelligent, creative and well – just plain decent – people for which I have one person to thank: Anne Boleyn. As a creative person, throughout early education you tend to get the ‘pat on the head’ treatment. People often see art as a fall back option, as the route one takes if you are academically challenged. Luckily, I come from a family routed in craft and all that is creative. Growing up, I would visit my dad’s workshop, where he and his Goldsmith colleagues would be creating the most exquisitely hand-crafted replica Faberge eggs, jewel encrusted Juke box or some other fantastically delicate and beautiful object – craftsmanship of which I can honestly say I have not seen the like since. And with a mother who was an amateur photographer in her youth and keen artist, a brother as a much in-demand graphics designer, artist and musician uncles and cousins, a poet and wonderful painter as a grandfather… I had all the inspiration and backing I could dream of. What on EARTH has this got to do with the one time Queen of England, I hear you so desperately crying. I always get swept into my childhood whenever people ask of my model and my reasoning for her creation. Back in 2008, I started my Degree in ‘Technical Arts and Special Effects’. I have never been one for ‘arty art’. I see beauty and intrigue more within the craft of an object, not just with something that has been created by the hand of man, but within nature also. Our own anatomy, for example, is unbelievably beautiful. I don’t, however, see the interest in an unmade bed. This I know many people will disagree with me on – but I guess it’s just what I have grown up around and my own personal preference. This is why I picked a subject that had a bigger purpose than ‘art for arts sake’… (Please don’t judge me on this sentence alone… art comes in many forms and a lot of it interests or inspires in one way or another, and it all tends to entwine into one another). Special Effects opened a world full of some of the best artists I have seen, all inspired by and involved in some of the best visual stories the world has to offer. I for one was glued to our TV as a kid. I loved the idea of being completely engrossed in a show – yes, it was the best form of escapism for a girl who was in her own world and a ‘bit of an odd one’. 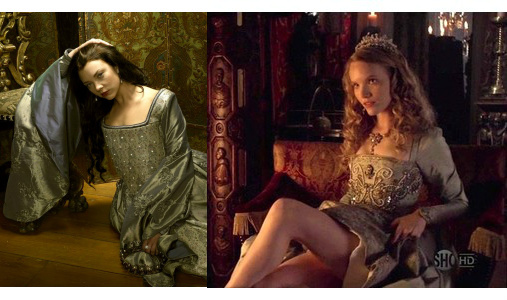 Please get to the Anne Boleyn bit now. 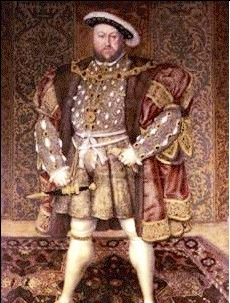 Like many people I have come across as the years have rolled on, when I was a kid the Tudors were THE most exciting thing: the larger than life Henry VIII with his huge bulging belly and obsession with bumping off his wives (or so the Horrible Histories books described). I say as a kid as this is where it began… but we all know this is not where it ends. As a kid, I visited Hever Castle at every chance I could get. I loved the drama of the place for this was the real life setting of my childhood stories. 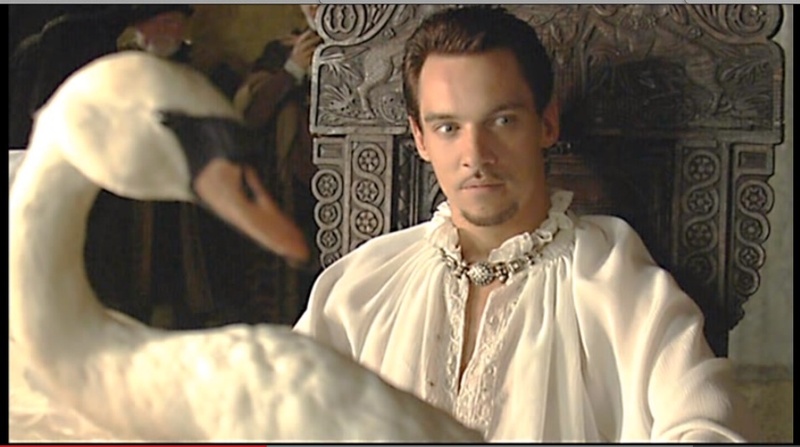 When I was 16, the most incredibly dramatic, exiting and sensual show flashed before my eyes – the BBC’s Tudors by Michael Hirst. 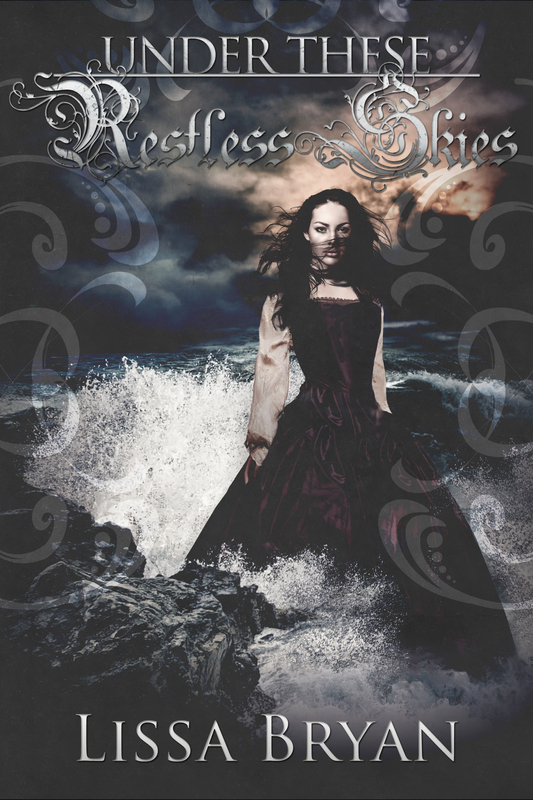 This was my kind of show and truly rekindled my love for Anne’s story. For all the historians out there, I truly apologise… but rest assured it lead me on my path to discover as much of her ‘true’ story as I possibly could. When it came to picking my final year piece at university, I could finally combine my love of making, craft and anatomy with my excitement of history and storytelling. 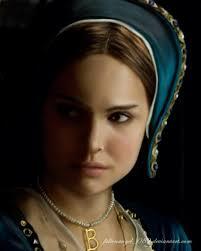 This was my perfect opportunity to really get to know Anne Boleyn. I was amazed at how she has been perceived throughout the ages. There are endless writings on her, from factual accounts to personal opinions. Novels, films, art, blogs that have continued to thrive since the moment she left this world. THE most amazing thing to me is that we still don’t know. We still debate to this day. And for this reason, everyone has their own version of Anne, their very own character in history that belongs to them. This is why I created my own model. My own Anne. As an artist, I tried to keep to historical accounts and records to keep to the ‘true’ Anne… but at the same time – she is my own. I am an artist, not a historian and I both celebrate and apologise for this. 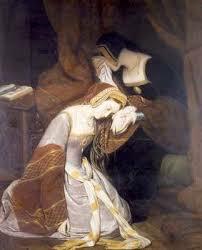 The piece uses symbolism to tell the story of Anne Boleyn and Henry VIII at a pivotal moment in their relationship. 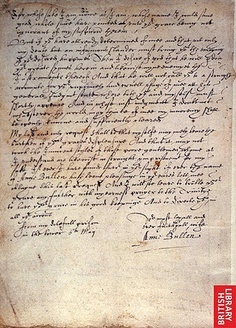 She holds a letter from Henry that declares his undying passion for her and his commitment to making her his wife, setting in motion the ideas of divorce from Katherine and the break from Rome. From this point onwards, things would change for Anne. 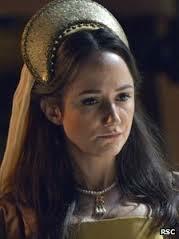 She is observing herself in a mirror, and reflecting on her position at this moment in time, holding a Tudor rose in her hand to symbolise her power over Henry and his people. The mirror is also used to mimic the infamous portrait said to depict Anne, we she too holds a rose and is wearing her recognizable B necklace. Around the mirror is the inscription ‘Le temps viendra’ written by Anne Boleyn in her copy of the Book of Hours and is translated as ‘the time will come’, telling of her impending downfall. For my degree show, I showed her in her undergarments to allow the viewer to become closer to Anne, as if they are witnessing her in a private moment – seeing the ‘real’ Anne. Her controversial 6th finger is to demonstrate the vicious rumours that were spread by her Catholic enemies shortly after her death and is one of the only representations of this deformity along side Charlotte Rampling’s depiction in the 1972 film, Henry VIII & his Six Wives. My model’s appearance is based on the profile drawing said to be of Anne by Hans Holbein – it is my favourite and the most ‘realistic’ portrayal in terms of style from around the time (although made after her death and not confirmed to be her). The model was accompanied by authentic handmade Tudor pomander beads (perfume) which Anne would most likely have had hanging from a pomander on her waist to mask bad smells and rid disease. 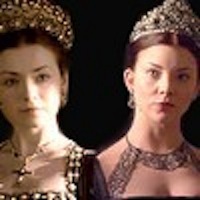 The show was finished with dramatic music from the BBC Tudors series to make it a multi sensory experience, and also to symbolise the modern dramatisation of her story. One thing that I continuously get asked is ‘Why the extra finger?’ I remember trying to decide whether to go with Anne’s alleged 6th finger whilst walking into our local petrol station near university for snacks. Whilst it was rolling around in my mind, the small group I was in grabbed me, and subtly pointed in the direction of the man serving behind the till. A lot of people don’t believe me when I tell them this part, but believe me or not, the man had an extra finger upon one hand. Need I say more. Apart from Charlotte Rampling’s depiction in ‘King Henry VIII and His Six Wives’, I hadn’t seen another representation of Anne’s infamous 6th finger. Of course I could go on for many pages on whether or not she had a growth on her hand, but you all undoubtedly know far more than I ever will and better places to find such things. Personally, I don’t believe she had an ‘extra finger’, if anything she would have had a small impediment which was exaggerated and used against her. 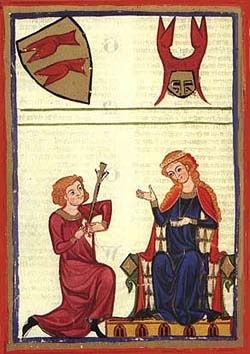 But I do know that this side of Anne always stirs up great debate and interest both with myself and others. For the Horrible History generation, it’s the “eeeeeeeeeew” factor and the magical idea of witches and the like. For the lovers of history, it’s the idea of malicious rumours and religious game-play. 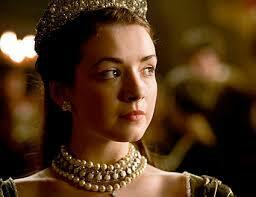 The majority of images or representations of Anne that I had come across didn’t show Anne’s story in any way. 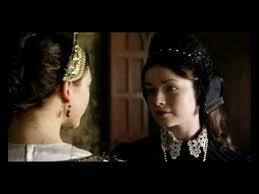 They relied purely on the ‘portraits’ of Anne and what we already know of history to tell the story. 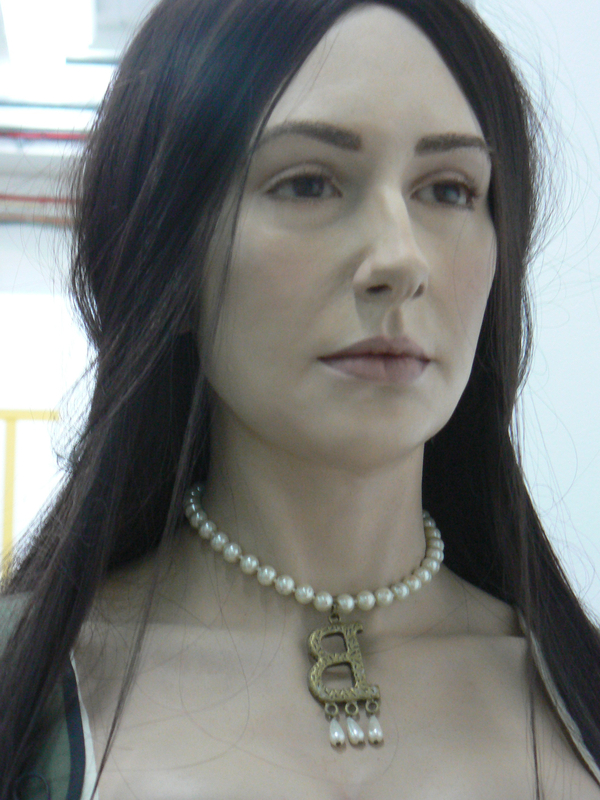 Although the idea of being close to these things does excite me (Madame Tussauds’ model still gives me goose bumps), I wanted more than a lute to tell her story. I wanted at least a small part of the debate that surrounds Anne to come across in my model. So in amongst the variety of Tudor and Elizabethan inspired symbols I placed within my exhibition (like the Tudor rose my model holds, or the words surrounding the mirror) I wanted people to see the finger and question why it was there. Had I found evidence to finally end the argument? What did the viewer already know? Would they assume that because it is presented on a ‘realistic’ model it is realistic in terms of history? But in all, I wanted people to challenge me on it. It was great to hear a conversation at my show on this exact subject: ‘Look she has an extra finger!’ ‘Yes, but she didn’t actually have an extra finger. It was made up by the Catholics’… ‘But I heard it was a friend that gave a description of it?’… Bingo! Hever Castle, however, wasn’t so thrilled. They asked me to remove it. It has been over 2 years since I made the model, and I have had a number of both creative and interesting people take time to contact me about Anne and not just about the model alone. Having the opportunity to be included in a book, the likes of which fuelled my excitement when creating my own Anne, has been brilliant and makes me proud to be a Boleynian. It also makes me a little happy to know that people DO question the finger…. for my plan worked. So, tell me…what are your views on the infamous ‘6th finger’?